Every December we hold our annual Student of the Year awards seminar and presentation ceremony. Each Instructor must put forward a handful of their top students who will go and train in the seminar and collect their award. Out of those selected, our Chief Instructor will then hand pick the top students and present them with our Student Of The Year title and trophy. The next Student of the Year awards is TBC. Over the years we have awarded hundreds of trophies to our top students but only a lucky handful have been chosen to receive the top awards. Below you can read about the students who have been chosen last year and the reasons why they have been selected. What an incredible year Izzy has had. She has always proven herself be an outstanding talent with the brightest of futures ahead but she really stepped it up in 2018! Izzy was still too young to try out for the JKS England Squad as she only turned 10 in July. Having already achieved her Black Belt at the age of just 9 (our youngest ever Black Belt), you had to wonder just how she was going be able to top her amazing performances in 2017, but top them she certainly did! Izzy absolutely cleaned up in Kata at almost all of the domestic competitions she entered, winning several gold medals for our squad. She has the rarest of qualities, somehow managing to never let nerves get the better of her at such a young age, she rises to every occasion and knows exactly how to put on a great show. I cannot wait to see her demonstrate at the 2019 awards. She’s a fantastic little student with enormous talent. She is so dedicated and always trains hard, is polite and has wonderful manners. She is an exceptional role model to all others around her age and certainly isn’t short on confidence. She’s proven time and time again that she’s a brave little fighter too. Forget that angelic little face with the brightest of smiles. She is one tough little scrapper. There have been a few competitions where she has been drawn again much taller students and boys, but she always brings it, every single time. Never afraid to get stuck in and give them a good whack or a kick in the head! This is the third Student of the Year award for Team Baron, Izzy follows in the footsteps of her big sister Grace who won our 2015 award and Dad Mike Sensei who won the adult award back in 2013. This family work so hard and are so dedicated to their karate training and after a terrible year of personal heartache, Izzy bringing home this award to complete the set couldn’t have come at a better time. Make no mistake, Izzy earned it, in her own right, just by being such a wonderful, beautiful and kind young lady and doing what she does best. Inspirational stuff, Izzy. We are so proud of you and we know there is so much more to come. This is just the beginning for you missus. If team Baron is to win Student of the Year every 2-3 years on average, I reckon Michelle should be aiming to complete the full set around 2020/2021! Now where did you put that gi??????? What a lovely young man with extraordinary talent. When I think about Jaime, I think about the progress that he has made by taking himself out of his comfort zone by attending classes that will challenge him and working with the other more experienced students who are capable of pushing him. There can be no doubt that by doing this, Jaime has improved immeasurably throughout 2018. Having achieved his Black Belt the previous year and knowing that it would be a long time before he could do his Nidan, other kids his age can become demotivated and eventually give up on their talent. Jaime has chosen to do the exact opposite. He seems to be more motivated than ever to learn new Katas and continue to fulfill his massive potential. They say hard work beat talent, but talent works hard, it will always be rewarded eventually and Jaime deserves this award 100%. Jaime is such a quick learner and always brings his absolute best effort to every class. He never misses training and doesn’t look for an easy option or a lazy way to do anything. His stances are superb, he is so sharp and quick and has brilliant Kata. Similar to Izzy, he usually finds himself up again taller and stronger opponents but is really brave and scores some amazing ippons in the kumite. He’s a pleasure to teach because his attention to detail is second to none and you can tell he practises all the time. He is a fab Cadet Leader and is a great help to Dad Gary Sensei in their class. His karate is inspirational to everyone and he works brilliantly with others, he never takes advantage of students with lower ability as he prefers to help them. We have no doubt that Jaime will continue to work hard and improve throughout 2019 and I’m looking forward to seeing his Kata demonstration at the next Student of the Year. Georgie Dyal has been training in our Club for over 10 years now and is one of our longest serving and most loyal members. She started when she was absolutely tiny and cute as a button. She’s still cute as a button but make no mistake, this girl could put your lights out and smile sweetly at you at the same time! Georgie is an absolute powerhouse with excellent technique. So dedicated, so hardworking and never ever misses class without good reason. You can tell she really enjoys ever aspect of karate from the fitness, to learning the Katas, to having a great scrap in the kumite, she absolutely loves it. What she may lack in technique at times, she more than makes up for in determination and effort. The progress she has made in 2018 is outstanding. She was selected for the JKS England Kumite Squad and this boosted her confidence massively. She has gone on to medal in several events and has everything it takes to become a champion one day. Georgie takes advantage of every opportunity to train and improve, she’s at every event we hold and always pushes herself beyond her limits. She has achieved her Nidan Black Belt earlier in the year with an absolutely brilliant performance. She’s never afraid to work with others who may have slightly more experience, because she understands that is exactly how you improve. She’s a very reliable and helpful Cadet Leader to Karen Sensei and we are so pleased she passes on her incredible talents to our youngsters coming through the ranks. The Wilmslow class are lucky to have her and I know for a fact that her help and loyalty is much appreciated by Karen Sensei. What is different about our Club is that we have so many amazing girls aswell as boys, who are equally determined to be awesome at karate. I’m sure Georgie looks up to many of the previous winners like Abby, Lori-Ann, Grace, Molly and Hannah Cain but she should be so proud to be part of that history now. Her name is up there with these incredible females because she is incredible herself. Winning this award should be a massive confidence boost to Georgie and will allow her to push on and keep on improving. We know there is so much more to come from you. Congratulations. Andy has had another great year and achieved so much in the relatively short space of time he has been doing karate. He’s absolutely flown through the Kyu Grades but been a stand out at every single grading. Andy has enjoyed plenty of competitive success and improved tremendously throughout 2018. He works so hard and is an absolute natural. He listens to everything you say and corrects everything you ask him to, straight away. He puts 100% effort into every class and his standard for a 1st Kyu is second to nobody. There are no weak areas to Andy’s karate and he is equally talented at both Kata and Kumite. He’s a really nice bloke too and assists his missus Jo Sysum Sensei run one of the most successful dojo’s in the Club. The class is always full and the standard of the students across the board is exceptional. He put in one of the best performances we have ever seen from an adult at his 1st Kyu grading and I have no doubt if he was taking Black Belt on that day, he’d have passed it. You can tell that his karate would be very effective too, he’s strong but has excellent technique. He doesn’t overly try and performs with class that is way beyond his experience. It can be hard for students who start karate in adulthood to achieve a really high standard but Andy is the perfect example of this. He is so dedicated training several times a week and this is why he is so good, although I am sure the super-strict Jo Sensei has a lot to do with it too! Can’t wait to see him attempt Black Belt this year and also perform a demo at the last Seminar. I’m sure Jo Sensei has him practising for both already and quite right too! Well done Andy. Very well deserved! Kevin has enjoyed a very successful year of karate, starting the year off as a 2nd Kyu and advancing to his Black belt by the end of November with a very impressive performance and one of the highest pass marks of the day. His karate is exceptional and by all accounts he is a dream to teach. We are very lucky to have him as one of our Cadet Leaders, passing on his high standard to the students of the Bolton Class. There are no shortcuts to success, Kevin is one of the most dedicated and committed students we have. He trains 3 times a week, every week. No excuses, no slacking, just consistent hard work, concentration and sustained effort. This is how you go from being pretty good to absolutely great and Kevin has definitely made that transition this year. It was just a few short weeks ago I was talking about his performance at the Shodan grading, what makes him so special and stand out from the rest. His karate is actually like Paul Sensei’s. He has the potential and the work ethic to be that good in the future. There is a natural quality to his technique that just can’t be taught, you either have it or you don’t and Kevin has definitely got a special gift. I could watch his karate all day long, it is beautiful and he is pure class. He is a lovely lad too, really nice, helpful and kind to others. He is not afraid to test himself against others by being on our squad and travelling the country to compete at external events. Kevin has had a very successful year on the road representing our club. He has collected 9 medals from just 6 competitions. 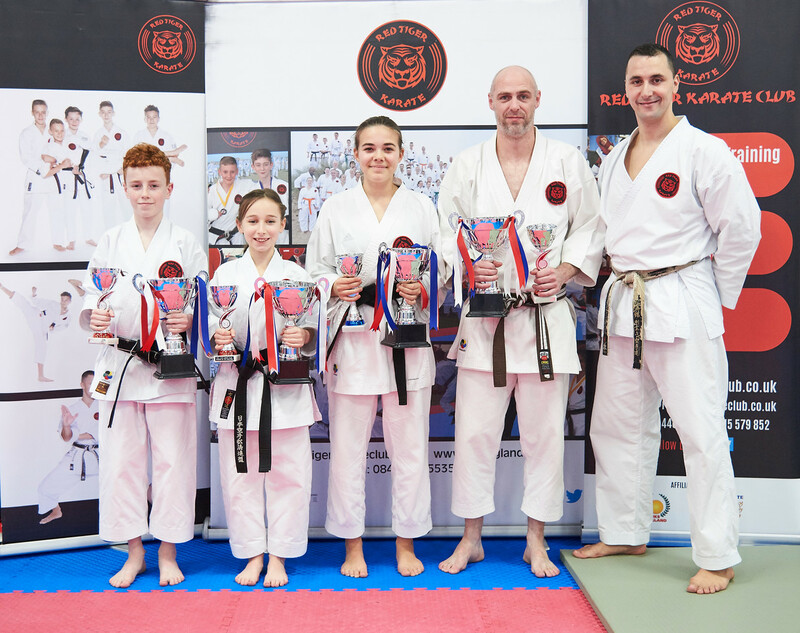 He capped off a great competitive year by coming 2nd in Individual Kumite at the JKS England Nationals and winning Gold in Individual Kumite, Team Kumite and Kickmaster at our recent Club Kumite comp. Kevin is equally gifted at Kata as he is at Kumite and there really are no weaknesses. We are certain that the more experience he collects, the more medals will come his way and we are looking forward to sending him to the England Squad trials in January. He will continue to go from strength to strength and has very supportive parents behind him to keep him grounded and motivated. Big thanks to you both for enabling him to achieve everything he has. You are doing an amazing job with him. Despite his obvious talent, he stays so humble and looked very shocked when his name was called out by Paul Sensei. I don’t think the Instructor team were shocked because we all know and appreciate Kevin’s quality. He will represent our Club brilliantly and continue to inspire others with his exceptional gift. Well done Kevin, I hope it has sunk in now, because you thoroughly deserve your award and the recognition for your effort and achievements throughout 2017. Let’s make 2018 even better. Ellis Pindoria-Stott was the number one name on my list of invites. Anyone who has watched this ten year old’s development over the last twelve months will know exactly why he has been recognised by Paul Sensei as one of the best we’ve got. He has had an extraordinarily successful year. I will later list all over his competitive achievements which will blow you away, but I am much more proud of the change in him as a student that has contributed to his success. The willingness to listen, learn and improve. The commitment he has shown. The positive attitude and willingness to try anything you ask him to. The way he works with and helps others. The maturity he shows at just ten years old. The way he will never take the easy option, he always wants to push himself. The way he watched his best friend Zak take this very award last year and rather than being jealous, was the first to congratulate him. The way he can take disappointment on the chin and get back in the dojo the next night, more determined and work even harder. Ellis really does deserve this award and will continue to inspire others and push himself further in 2018. He has enjoyed a very successful year as part of our squad walking away from both the JKS Novice Comp and the JKS Kyu Grade comp as Grand Champion – defeating everyone else in both Kata and Kumite, winning Gold and Silver medals at both our Club Tournaments, becoming Kickmaster Champion at two competitions. He really has been outstanding and is a pleasure to coach. He is calm under pressure, listens and tries exactly what you ask him to. We are sending him to the JKS England Squad trials in January as we fully believe that he has what it takes and is ready to challenge himself at the next level. We know he will work hard, keep a positive attitude and will never let us down. He is our gorgeous little dynamite man and we are super proud that he is flying the flag for Red Tiger! He was also exceptional at the Dan grading where he received his 1st Dan Black belt and got a great pass mark. I am so excited to see him develop further in 2018, because he is super talented and still has so much more to achieve. Congratulations Ellis, keep up the great work little man! He couldn’t do this without the support of his parents especially Danni, who drives him all over the place taking him to the classes which will allow him to develop his talent properly. Thank you both for all you do, he is so great because of you two believing in him and enabling him to do what he does best – lots of awesome karate! Abby has had an absolutely brilliant year and really stepped up her game. We have always known from the beginning that she had the raw talent and potential to be very special indeed. It was a little up and down for her in 2016 but right at the end of the year she won Gold in the JKS England Nationals for her age group in Kata. This seems to have been just the confidence boost she desperately needed to kickstart her success. She’s been on fire this year. Really focused, really determined and above all, you won’t find many students more committed than Abby. She’s at karate almost every day and trains hard. It has become her life. The difference between Abby in 2016 and Abby in 2017 is that now she believes in her own ability. Like the flick of a light switch, she realised that she is talented and she is up there with the very best young girls we’ve got. This year, she’s been on a mission to prove it. I’m sure there have been times this year when her Instructors have been on her back where she questioned, is it really worth it? But we are so glad she stayed strong and has made outstanding progress as a result. She has medalled at lots of tournaments throughout the year and once again achieved Gold at the JKS Nationals in the team kumite event. Amazing stuff. Abby was exceptional at her Dan grading, successfully passing her Nidan at just 13 years old. She was 100% focused on being the best she could be. Her kumite was awesome and she gave an outstanding performance in the Kata section. This was no fluke, it wouldn’t have mattered which Katas were chosen for her, because she put the work in week in, week out and always has. It’s a good place to be as an Instructor when you don’t have to worry about what the examiners choose, because she’d have blasted her way through any and scored highly. What a little superstar we have. Another inspirational young lady who is absolutely lovely in every way. She is such a pleasure to teach and have around. She is a fantastic Cadet leader, so reliable and I never have to worry about what she is doing whilst she is teaching groups, because I know she will be passing on excellent karate. She has joined the likes of Grace Baron, Lori-Ann Moran, Molly Austin-Hogsden, Emily Withington, all these extraordinarily talented young ladies who have been chosen for student of the year and gone on to do great things. Abby has always looked up to these girls, congratulations, this year you have become one of them. Be so proud of yourself missus, because we are so proud of you. Well done to Sharon too who has been there from the start, sitting at the side night after night, fighting traffic, kicking Abby up the backside when she’s needed it, being supportive both emotionally and financially and doing it all on her own. Superstars usually have superparents backing them and Sharon is definitely a SUPERMUM! I am so pleased to be adding this name to the Student of the Year page, having watched this young mans development over the last few years. He won’t like this but it has to be said, when he first came over from another Club, he could be a teeny-weeny bit lazy at times! But we could always see the quality in him and the extraordinary potential that he now more than fulfills. Ten thousand shoutings at later, and here we are! He has worked so hard over the past few years to earn the respect of everyone in our Club. He has had many up’s and down’s along the way but this year there have been nothing but up’s I’d like to think. Connor was a very strong candidate in 2016 and it was a little disappointing for me that he didn’t get the recognition I felt he deserved, but Paul Sensei felt there was so much more to come and for once, I hate to admit he was absolutely right. Connor himself had no complaints and made it his mission to just concentrate his energy on improving both his training and teaching. His consistent training and hard work has paid off and looking back he’s had a hugely successful year. He has spent a total of four weeks in Japan training twice a day with the very best Instructors in the World. I wasn’t worried about taking him to Japan for a second, he trained his backside off every single session in the dojo and we were proud that he (and Lori-Ann) were wearing our badge and representing our Club and JKS England. I’d like to think he earned a little bit respect out there because as much as they tried to break us, we went back for more punishment, day after day. Not once did Connor not want to go and learn from the best, because he loves karate and wants to improve. Connor has been at every course and event we have run, training hard and helping out. He has won lots of medals at both of our tournaments and was undoubtedly the competitor of the day at the kumite comp with his superb kicking techniques and classy performances. Everyone watching his events knew his name by the end. He was amazing. He is extraordinarily gifted and doesn’t waste this natural talent. He knows as a Nidan he should be setting a great example to others and does this without fail, every single session. Connor has been such a fantastic role model for the Denton class and a great help to me over the last few years. I’m so proud of everything he has achieved. The class absolutely love him. Paul Sensei has now promoted Connor to Instructor and he will now take over his own class. I can’t think of anything better than a class full of mini-Connors. He will be a brilliant Sensei and will have brilliant students. I could write about how great Connor is all day, but we don’t want him getting a big head so I’ll finish it by congratulating him on becoming our Student of the Year 2017, a title he fully deserves and a responsibility which he will take very seriously. I also want to say that it has been a pleasure to be alongside him on this journey and see what a wonderful young man he has become – a true karateka. Polite and respectful, talented yet hard-working, mature beyond his years, determined, inspirational yet still humble, generous, kind and soooooo funny! He doesn’t even mind when I give him silly nicknames, he just laughs along! He is a credit to Joanne and Michael who must be bursting with pride at everything he does. He is a credit to you and is proof that you are both brilliant parents. Keep up the great work. If you are inspired by the students above – and you should be, make it your goal to follow in their footsteps in 2018. Set your goals now and don’t rest till you achieve everything you want to. As with everything in life, you get out what you put in. Try hard, be at everything, learn, listen and remember and above all, always do your best. It was just this week I was writing about Ben Duckworth achieving his Nidan at the November grading in great style and here I sit again, finding it easy to tell others what sets this wonderful young man apart from the rest. He is a true fighter and an extraordinary inspiration. Ben started karate back in 2008 when he was just 5 or 6 years old. He was fighting an aggressive form of cancer and would go for a lumbar puncture in the morning and go to train in karate training in the evening. That is what you called true courage, bravery and dedication. Ben still devotes all of his time to karate. He trains 4-5 times a week every week. His parents are so supportive, taking him to every event in Red Tiger and every event in Nottingham with the JKS. He’s trained under Kagawa Sensei, Okamoto Sensei and Arimoto Sensei, watching listening, doing and taking it all in. You will never hear Ben talk about the things he’s been through and you’ll never hear him make any excuses. He doesn’t know the words – “I can’t” because – “he does”. Karate comes first for him and that is why he has become so great. He was exceptional at his Nidan grading and it was a pleasure to work with him in the run up. Ben gets on with it at every class. He’s there all the time training hard which is great for me because he remembers everything – and I don’t! He’s a brilliant Cadet Leader and is very good at passing on what he has learned enthusiastically and I am completely confident what he’s teaching will be correct. What has changed in the last 12 months with Ben is that he is now much more confident than ever before. He knows exactly what he’s doing and performs to a very high standard. Ben will do well in life because he is a fighter – a true karateka. He set his goals this year to achieve his Nidan and become Student of the Year and there was nothing ever going to stop him. Extraordinary strength in character for somebody so young. Keep on doing what you are doing young man. Huge well done! We have to start off by saying that you will have to go a very long way to find someone more committed to karate than Danny Silverwood. He absolutely loves it. He is very talented and when you train with Paul Sensei this can either make you or break you. If he sees your talent, he is very hard on you, that way, you end up fulfilling your potential. I sometimes think that Paul Sensei just actually enjoys shouting at Danny, but when you see how he performs now, it makes me realise that it is exactly what he needs. It is the only way to get the very best out of him. Danny has definitely turned a corner this year. He’s always been amazing at karate. Very dedicated, very hard-working but this year we have seen him the best of him. We’ve seen him fulfil that enormous potential at last. He’s earned his Nidan at a very young age, he’s attended just about every event we have on the calendar, he’s worked harder than ever before and grown so much in confidence. He took one on one lessons in order to improve before his grading and this paid off for him big time on the day. He was just marvellous. Danny is a great character to have in class. Really spirited and determined. He’s an excellent little helper down at the Handforth Dojo and never lets his team down. The kids really look up to him and so they should. Above all, we love that Danny remains very humble, he is a pleasure to teach and a genuinely lovely young lad who is a credit to his parents. Nobody in the club can deny that Danny deserves this award and has earned it throughout the year. This is a great honour and a big responsibility for him to carry and keep him motivated throughout 2017. Well done Danny, you are awesome. Jake trains at the Darwen dojo with Sensei Nicola Holland and her team of Assistants and Instructors. He’s a natural athlete with high ability and great expectations on his young shoulders. He has hit the age where he could be going out with his mates, but Jake chooses karate, he chooses to train and get better at something he is very gifted at. This discipline and determination will take him far in life. He has always stood out in gradings and events because of his work ethic, great attitude and a clear desire to listen, learn and improve. We always hear about the great things he does in class as Nicola Sensei is his biggest cheerleader and she really appreciates the effort he puts in and the perfect role model he is in classes. Jake is not only impressive when demonstrating at the front of class, he is also an excellent cadet leader. He is patient and kind when passing his karate onto others and you can see that the youngsters really look up to him. Jake does not take his natural ability for granted, he is very keen to get better and diligently studies the finer details. He is extremely dedicated to his karate and this will take him very far. His karate journey so far has been a short but highly successful one and we are certain when it comes to events and gradings in 2017, his star will shine even brighter because he now knows that others believe in him too. For someone so talented, he lacks confidence and fingers crossed this will be the boost he needs to take his karate to the very next level. It is fantastic that Paul Wolstencroft Sensei has recognised his quality as Jake has the ability to be absolutely phenomenal at karate. A well deserved trophy for a wonderfully kind and well-mannered young man. What a year, what a superstar. It just had to be Zak, 2016 has been his year. Zak has achieved so much in this last twelve months. He has been so focused and is a pleasure to teach. Zak has only just turned 10 and has extraordinary talent, he is so sharp and controlled in his movements. He is a very intelligent young man who has trained hard and knows a lot of Katas, even a few he doesn’t even need. He is intelligent when sparring and seems to have the ability to choose the right technique at the right time. Anything and everything his Instructors ask him to work on; he gets it sorted for the next time you see him. He must drive his parents crazy practising at home. Eat, sleep, karate. That is what this boy has done in 2016 and he deserves this trophy and all the medals he won throughout the year. We are very proud of the fact that he has been the JKS England National Kata Champion for two years in a row. He seems a little worried about moving up into the older category next year, I tell him – let them worry about you! He is the Cadet Leader at the Denton dojo and they really have no idea how lucky they are. They have Connor Cherry – a superbly talented Nidan, Sam Jackson a former Student of the Year and they have Zak as their Cadet Leader. It’s like a dream team and Zak sets a brilliant example to all the younger children. I can see when they watch him that they want to just like him. And I’d love a room full of Zak’s. We are so proud of you little man. Flying the flag for Red Tiger all over the country, setting a wonderful example by staying humble in victory or defeat. Zak keeps his feet firmly on the ground. I am already looking forward to seeing what you are going to do for your demo next year and being there for all your achievements in 2017. Looks like it is going to be another great year. Grace Baron is a lovely young lady who comes from an equally wonderful family. She has been training for over 4 years and during that time she has transformed from a shy and quiet little girl who suffered terrible bullying; into a confident and exceptionally hard working young lady. Beautiful on the inside as she is on the outside and a pleasure to teach. She is an outstanding Cadet Leader and such a focussed and determined student when training in line. She does karate almost every day, yet never looks tired, bored or lazy. Her 2015 could be described as crazy, selected for the England Kata and Kumite Squad, earned her Shodan with the JKS, at competitions – got beaten up, but won Kata, got beaten up again, but won Kata again, got beaten up again and lost Kata and finished the year by coming 2nd in Kumite and 2nd in Kata. There have been some real ups and downs but her determination, confidence and work rate just goes up and up. She has a lot to thank her Mum and Dad for as they are the ones who enable and support her in every challenge she chooses to take on. She was shocked to receive the trophy but she must have been the only one to be surprised. She’s been earning it all year. Well done Grace and thanks to all the positive role models who have helped Grace along the way, the Instructors inside and outside of our Club who make sure she started on the right path (Sensei Jonathon Walls) and those who make sure she is continually improving (especially Mike Baron Sensei who makes sure that those feet stay firmly on the ground!). Stay humble, continue your hard work and we look forward to seeing our Champ doing her demo! It will take Rob about six months to actually process in his head that he has won this award. We have no idea why he lacks confidence and self belief, when he is able not only to perform karate so impressively – but he has the ability to make others believe and be confident in themselves. Rob is always helping other people and inspiring them. He is there with wise words of encouragement, constructive feedback and unwavering support for those who train alongside him. This award is not just a popularity contest, although if it was – he would probably win that too. It is to recognise when somebody has a special talent. Rob has such a positive attitude, he is hard working and has improved tremendously throughout 2015. He has approached his training with more focus and determination and has really had to battle some demons to put himself through Instructor training and become what we all know he would be an absolute natural at – a nurturing and dedicated Instructor. He works hard outside of karate and has had to juggle a lot of commitments to make sure that he could benefit from everything we have on offer here at Red Tiger. Hopefully, Rob receiving this award will finally give him the self-confidence he needs to boost him towards teaching his own class, achieving his Nidan and continuing his remarkable rate of progression. An awesome Karateka and a true gent. Well done. As we have said in the past, the Kyu grade award is all about recognising somebody who is coming through the ranks who has raw but extraordinary talent. Molly has joined us from a Club in Spain and we can only liken this signing to somebody like Kevin De Bruyne joining Manchester City or Anthony Martial joining Manchester United, she was good before, but now she’s amazing and we are very lucky and very grateful to have her. Mike Baron Sensei and Grace have worked so hard with Molly and developed her Karate into another league. She puts herself out of her comfort zone and trains at the toughest classes, with the highest grades in order to gain experience and grow. She is a brown belt of the highest calibre and recently came 2nd in Kata and 3rd in Kumite at the JKS Nationals which is incredible as she was up against far more experienced Black Belt competitors. Molly is a warm, friendly and polite. She has no idea just how good at karate she is and there is so much more potential to unlock. An incredible student and a flawless choice by Sensei Paul. We are looking forward to your demo already. It was only last week we were congratulating Matthew on his excellent performance at his first kyu grading but this week he has gone one better – by becoming the top young male in our Club and he is not even a Black Belt yet. Matthew is extraordinarily talented and naturally gifted. He is as good at kata as he is at kumite and you will NEVER see Matthew being lazy, messing around or choosing not to concentrate. It would not be an exaggeration to call Matthew a young prodigy. He is 100% committed to his training and sets an excellent example to others. He was the Grand Champion for his age group when he entered the JKS Novice Competition earlier this year, winning both Kata and Kumite. This did not affect Matthews training or attitude at all, he is hungry for success but it doesn’t consume him. He enjoys his training regardless and we know that students this good, with this kind of attitude are few and far between. He is very humble and appreciative of everything he gets. Matthew is an inspirational Cadet Leader and there is no doubt that he will do an exceptional demonstration and this trophy won’t change him one bit. Well done. I am sure this award came as no surprise to the vast majority of students and Instructors at Red Tiger. Students do not come more committed and dedicated than Lori-Ann Moran. In fact, the only person who would have been surprised that she was chosen would be Lori-Ann herself. Her humble attitude and quiet nature are just two of the countless reasons why she has been chosen. Lori-Ann is in the dojo 5 days a week, sometimes 6 if we have weekend events. She does not get pushed to do this, she does it because she wants to. Lori-Ann genuinely loves karate, she studies it diligently and always applies herself properly. A dream student perhaps? Absolutely. Never satisfied with where she is up to, constantly looking for ways to improve in every area – she is perhaps one of the easiest students to teach in the entire karate club. You show her once, she can do it. You ask her to try something a different way, she gets on with it, without question and practises that way until it becomes a natural movement. These attributes are important and essential at her level and will enable her to progress through the Dan grades. What is more important than anything else is that she is one of the most kind-hearted and sweet-natured girls you would ever wish to meet. Always polite and helpful and a complete inspiration for all the younger girls training here at our Club. She uses her talent and skill only for good. She never takes advantage of lower grades when sparring and is highly capable of teaching others correctly and passing on karate with enthusiasm. She has enjoyed a very successful year with many highlights including; putting in an outstanding performance at her Shodan grading and winning both kata & kumite in one of the most competitive categories at our June Tournament. Lori-Ann helps out at gradings and never misses any of our events. She could not do this without the help and support of Mum Julie (with her camping chair) and the Moran family so we should say a big thank you for enabling her achieve everything she has so far. There is so much more in store for Lori-Ann and as a relatively new Black Belt she has so much more to learn and keep her motivated. We are confident that she will continue to work hard and achieve so much more – especially now we are in the JKS and opportunities are much greater. Congratulations on your well deserved award Lori-Ann and we are already looking forward to seeing your demonstration at our 2015 event. I want to start by saying that Regan Duckworth is one of the most naturally gifted Karate students that has ever trained in our Club. He can perform advanced techniques (especially kicks) to a very impressive standard and make it look easy. He picks up kata patterns after practising only a couple of times. His kumite is exceptional and he can lift the level and adapt according to whoever he is partnered with at the time. Regan has earned this award because of his karate and we truly believe that in December 2015, Regan will step on the mat and do the business in the Student of the Year demonstration. He is that good. He is also a fun character to have in classes who can have a laugh and doesn’t take himself too seriously. Underneath the bravado, Regan is a sweet lad and you can tell that karate means a lot to him. He genuinely enjoys training and testing himself. Regan has achieved so much with his karate and was very close to being selected as last years winner as when he went for his Black Belt and was superb. He has continued to train and continued to further improve. Regan has taken part in all of the events we have run this year including our tournament, both training weekends, every Brown and Black Belt Course and helped the Instructor team out at gradings. Being chosen as Student of the Year carries great responsibility. We believe that he is now ready to carry this and begin to fulfil the massive potential that has always been there. He must focus in class and set a good example to others around him as they will now look up to him and copy the way he is training in the dojo. The award definitely came as a shock to him, but once he starts believing in his own abilities, the sky is the limit for this excellent student. Opportunity is great within the JKS and we would like to see Regan getting involved and testing his karate on a competitive level. Scott Galvin is one of the Clubs longest serving students. He has been around from the very start back in 2006. He joined our Bury class and has trained consistently, without any breaks every single week. Scott was always an excellent student and a pleasure to teach but in the last two years, he has been taking his training very seriously. He was one of the Clubs very first Black Belts, our first ever Cadet Leader and this year became only our third junior to achieve Nidan. Scott now trains almost everyday, when most teenagers his age are out with their mates or playing computer games, he is in the dojo where it counts, working hard. He has made massive improvement this year and was exceptional at his grading. Scott has to work really hard at karate and is always at class quietly working away and improving whilst making it look effortless. Scott has always performed Kata to a very high standard but in the last couple of years he has vastly improved his kumite and kicking techniques in particular. He is really learning how to use his reach and leg length to his advantage. More importantly, he is very kind and patient when teaching others. He gives up his time to help out at gradings and is always helping out Sensei Brandon and the students at his classes. Scotts karate is very clean and has excellent technique. As he is getting older, this technique is really starting to become effective and he would be very capable of looking after himself if he ever needed to. This award should be the confidence boost Scott needs. He sets a great example to others and has recently started to train at Senior Class to further develop his skill set and knowledge. Congratulations Scott, it has been a long road for you and you are thoroughly deserving of being our Student of the Year 2014. Louis Johnson has only been training for about 3 and half years, but during that time he has achieved a whole lot. Louis is a very rare and special talent, somebody you just know is going to become a very successful person. Anybody who has seen Louis train will recognise that he just has this gift. When Louis performs kata, it really is just a joy to watch and you are left wanting to watch more and more. If you don’t practise karate, he makes it look easy and effortless. If you do practise karate, you just know and appreciate that he has practised over and over again both in the dojo and at home to make it look that way. His attention to detail is second to none. He is like Sam Jackson in that he will never be satisfied until it is just exactly how he wants it to be. You will never see Louis being lazy or not trying the very best he can. Sensei Paul is very lucky to have him as a Cadet Leader and he sets a perfect example to the younger students and lower grades. What will strike you about Louis is not only his exceptional karate, it is the fact that he is absolutely lovely. He is capable at such a young age of carrying this responsibility and this award will not go to his head. He is still inspired by others and is working hard every lesson towards achieving his black belt. He never messes about and is constantly practising at the start and end of every lesson. His stances are amazing and this is the strong foundation he has built the rest of his karate on. Louis is a credit to his Mum Catherine and they travel all over Manchester by train to get to karate classes and all the events we hold. There are not many students who would be as dedicated as these two and this effort must be recognised and rewarded. We would like to see you work to improve your kumite over the next 12 months by putting together combinations and working on your distance when sparring, that way you will become a better rounded student. Congratulations Louis and keep up the good work. We are sure there is more to come from you over the next few years. This was one of the most difficult years to select a junior female, as so many really talented girls have been coming through in the last couple of years. So Hannah has beaten off some very good competition and should be even more proud of herself for doing so. Whilst most 15 year olds will be out, hanging around with their mates or playing computer games, Hannah is in the dojo. Training, practising and working hard. She started her karate at the Radcliffe dojo with super talented sister Rebecca and Sensei Nicola Holland. She has since been to about every class she could get to in the area and trains almost every day. Anyone who has seen Hannah do karate will know that there is such focus and intensity that makes it so effective. She took first place in the kumite for her age group at our June tournament and enjoyed a very successful year. Her attitude has improved so much over the last 12 months especially since she has been helping others. She is at karate to train but is kind and patient when helping others. She sets the highest standards for herself which will enable her to continue to improve year after year. She sets an exemplary standard to others. All of the young girls and teenagers in our Club should and do look up to Hannah and that is why we have rewarded her talent with this award. Well done, keep up the hard work. We look forward to working with you to help you achieve more and more. Sam Jackson has shown incredible potential right from the very first class he attended with his awesome sister Charlotte in Denton back in 2010. He has enjoyed a brilliant and successful year and really begun to fulfil his potential. Some of the highlights include; grading from 4th Kyu to 2nd Kyu and being selected as Student of the Grading, coming 2nd in the Kata Video competition, training with and being picked out by Hitoshi Kasuyu 8th Dan, training with Nobuaki Kanazawa Kancho, working hard at both training weekends and winning 1st Place individual kata and 1st Place individual kumite trophies at the June tournament. Sam arrives early at every class and practises from the minute he gets in the dojo, without being prompted to do so. He practises at home constantly. It is that commitment and dedication that enables him to achieve things that most others don’t. He used to struggle with his stretching, he worked at it and now does box splits and side splits. Everything you ask him to correct, he does – instantly. He is always polite and a fantastic Cadet Leader inspiring students to do better when he is teaching rather than just telling others what to do. He trains three to four times a week, every single week without fail or excuses. He wastes no time in the dojo and will make an exceptional Black Belt when his time comes. Congratulation Sam, keep doing exactly what you are doing and keep aiming on high. You deserve to be Student of the Year and should be very proud of yourself; we are very much looking forward to seeing your Kata demonstration next year as your katas are always very impressive. Mike started at Sensei Jonathon Walls Aspull dojo back in 2010 joining with eldest daughter Grace. Now his whole family take part in karate including his lovely wife Michelle and youngest daughter Izzy. Talent for karate certainly runs in the Baron household with Grace placing 3rd in our kata video competition earlier this year. Mike is a very gifted student and a thoroughly nice bloke! He has high ability and trains very hard every time he is in the dojo. He is 100% committed to his training and rarely misses a single class. His talent is unique in that his karate looks effortless; it is neat and tidy yet still very effective. He pays great attention to detail when training and has the ability to correct anything he is asked to immediately. Mike has no ego and no idea how good he has actually become. He is equally good at kata as he is at kumite and there are no gimmicks. His karate is technically sound and the underpinnings are absolutely solid. It is quite fitting that he follows Sensei Joni and Sensei Callum as he too, in the New Year will begin teaching his own class. Something we are sure he will do to the very highest of standards. A big well done to Mike and are very lucky to have you joining our Instructor team. Nobody can fail to recognise that Joe Ratcliffe is a massive talent and has very exciting potential. He trains 3-4 times a week and is a very gifted athlete. His commitment since joining the club has been second to none. He has trained at all possible courses and was recognised at the March training weekend and given an award for outstanding effort. His karate is similar to Mike Barons in that, he makes it look so easy. His katas are always performed to a very high standard and he has always been particularly impressive at his gradings, going from white straight to green belt. When deciding on a kyu grade, Sensei Paul considers who has the raw talent and potential to be absolutely awesome and nobody at this time fits this better than Joe. Below is a list of our previous winners most of whom are still training as impressively as ever. Some have gone onto achieve Shodans and Nidans. A few have become highly successful Instructors and one has gone on to enjoy an International tournament career. These students are the future of modern karate and we are proud to have them as part of our history.